It’s always good to get away from the big smoke and better still to have the opportunity to visit new gardens in unfamiliar places. So on our way up to Yorkshire for our friends’ wedding we took a very short detour off the M1 to visit Felley Priory, a garden of about 2.5 acres. The Priory of Felley dates back to 1156, but the brick part of the house pictured above dates from 1557. A Jargonelle pear tree growing on the house walls is thought to be as old the building itself. There were additions to the house over the next four centuries and it now sits low and informal in its rural setting. The garden as it is today was only started in 1973, so it’s exactly as old as me, but significantly prettier. Now the tightly clipped topiary gives it a genuine air of antiquity, a bit like my grey hairs. 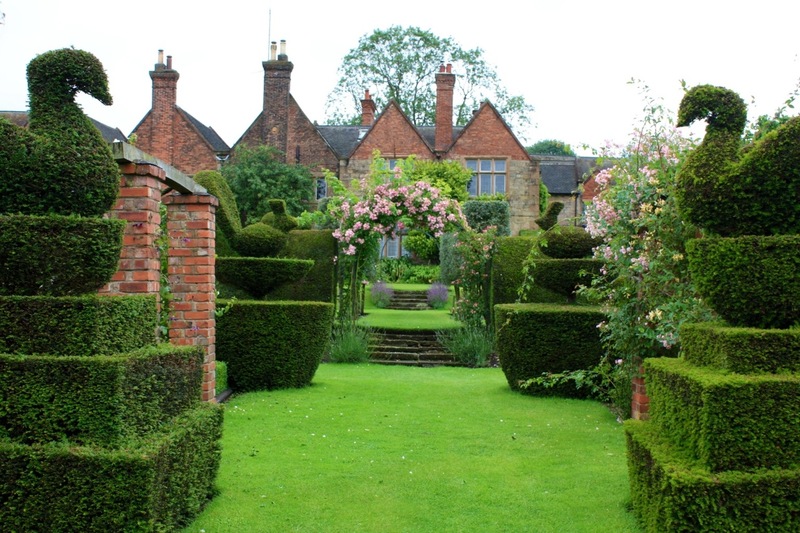 The terraces are divided by several yew hedges and bounded by an ancient sandstone wall. 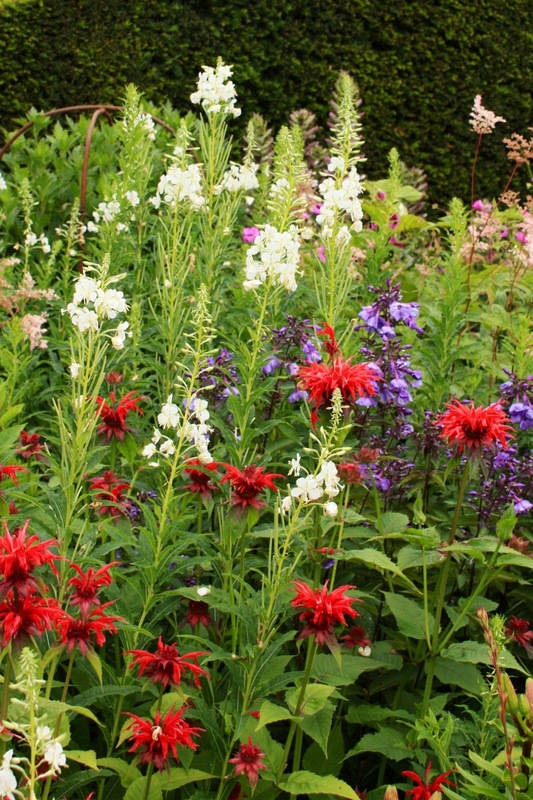 Inside, the planting is relaxed yet complex, featuring a number of rare and unusual plants. There were extensive collections of Hosta and Hydrangea as well as lots of roses and Clematis. The herbaceous borders were boiling over with flowers, some of them bent to the ground by rain (no, it hasn’t stopped yet!). This patriotic planting of Phlox paniculata ‘Blue Paradise’ with scarlet Monarda and white rosebay willowherb (Epilobium angustifolium album) stood out brilliantly against the dark hedge. 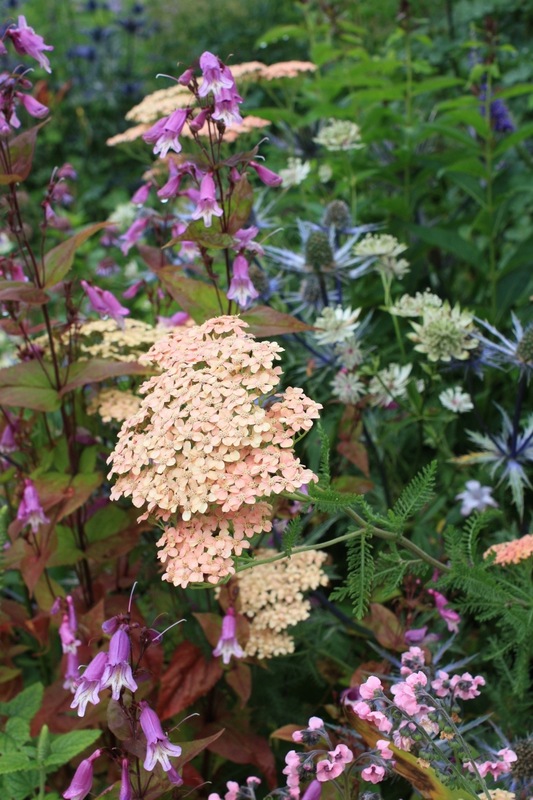 In another section of the border, the sensitive group of Achillea, Penstemon, Eryngium and Astrantia pictured above caught my eye – that winning combination of peach, bronze and pinky purple once again – almost looking autumnal. The constant rain had made the lawns sodden, although they were exceptionally green and well maintained. 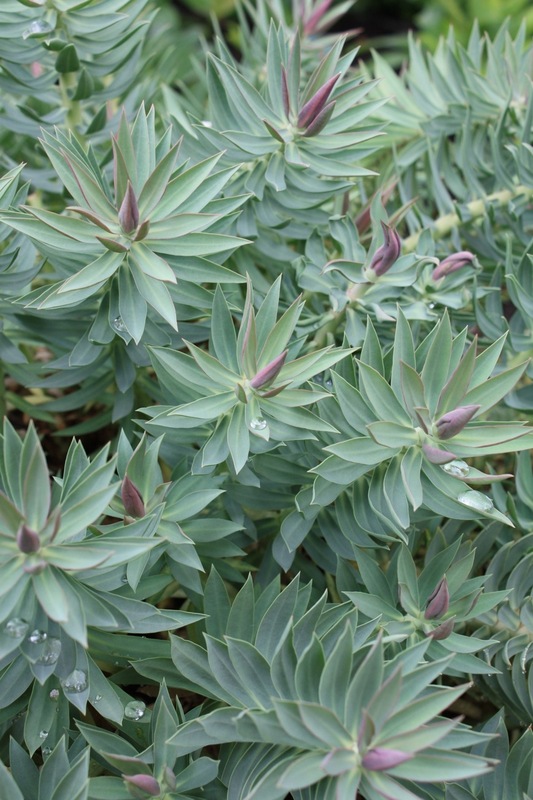 I loved the way the raindrops had beaded on this silver Euphorbia rigida “Chris Brickell”, a completely new plant for me, a little like Euphorbia myrsinities but with larger, pointed, glaucous blue leaves. I seem to have a bit of a thing for spiky plants at the moment, so it was good to find the prettiest of all spiky perennials, Morina longifolia in another part of the garden. 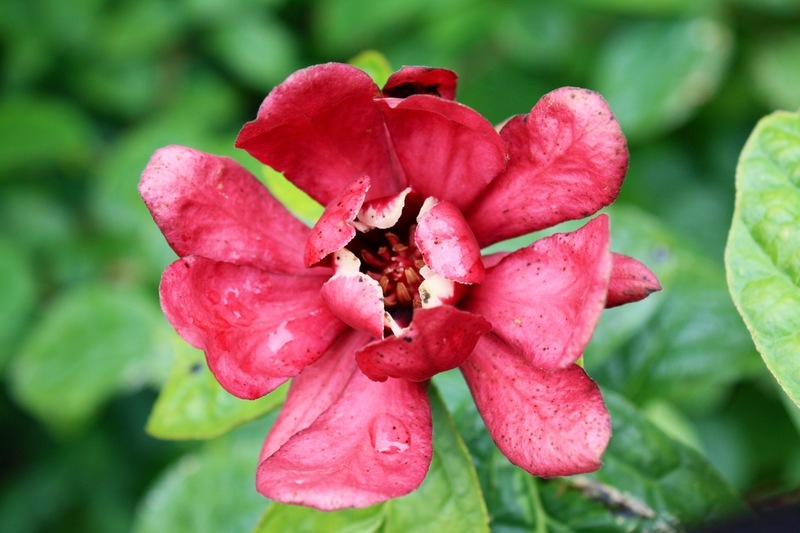 Whorlflowers, as they are commonly known, are native to the Himalaya. 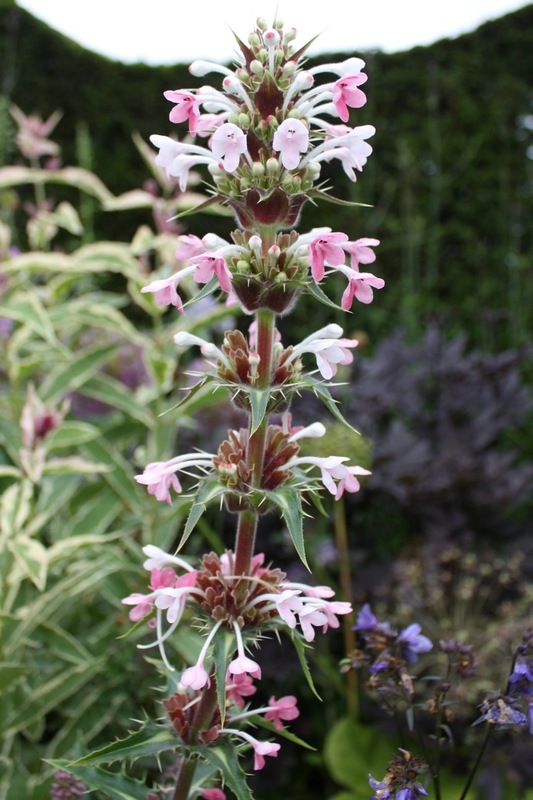 The prickly, aromatic foliage appears beneath the 2-3ft tall pagoda-like stems, with whorls of long white tubular flowers, which eventually change to rose then crimson as they mature. I resisted buying any plants, as I have nowhere for them, but they can be grown easily from seed……one day! In their element in this northerly garden were a number of unusual shrubs, including Hydrangeas, many of which I had not seen before, and Sinocalycanthus raulstonii ‘Hartlage Wine’, below, which has lightly scented, maroon flowers up to 7½ cm across. 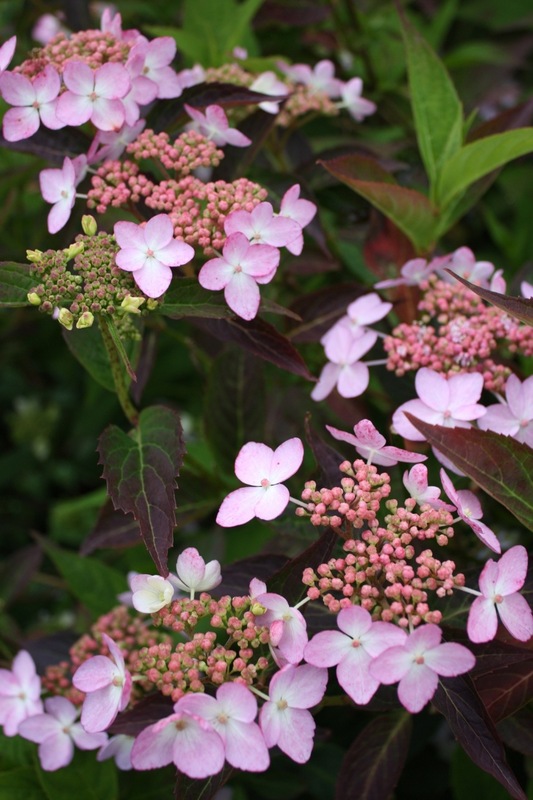 These shrubs enjoy moist, well drained soil and dappled shade. The sloping site probably helps with the drainage, and the rain does the rest! All in all, a lovely, intimate garden and not shared with too many other visitors, so very enjoyable to wander around. Plus RHS members can get in free on Tuesdays and Wednesdays.